Health update: Les received a phone call today to say he has an appointment this Friday afternoon with a consultant/surgeon. 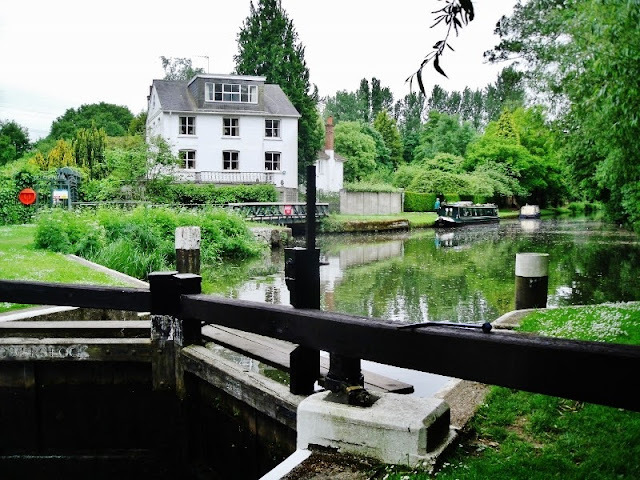 The front yard of this house opens onto the Thames so all the mail slots are on the towpath side of the houses. Jaq is surprised to find a U.S. Post box mounted on a front gate. Perhaps an American is in residence here. 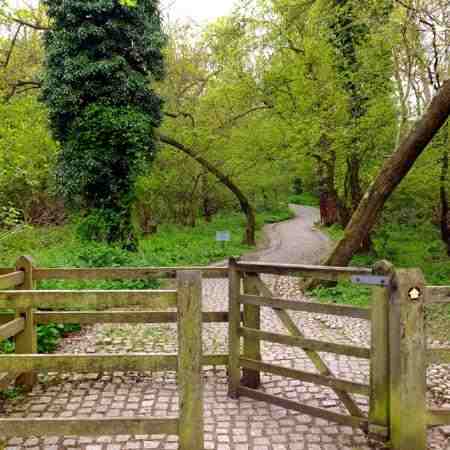 This is the path from the Thames, across the fields to the Magna Carta Memorial at Runnymede. This is a lovely memorial on the lower part of Cooper's Hill is built in the Classical style to commemorate the sealing of the Magna Carta on June 15, 1215 by King John requiring the King to proclaim certain liberties and accept that his will was not arbitrary. For example it was explicit in stating that no "freeman" (in the sense of non-serf) could be punished except through the law of the land, a right that still exists. 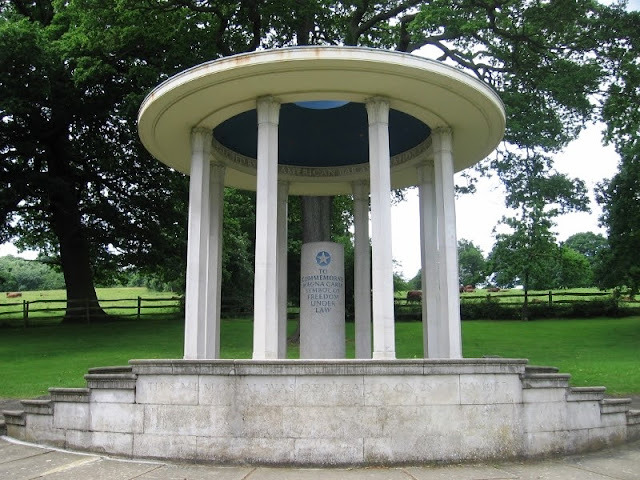 the beginning of English Law and hence American law took root here on the fields of Runnymede. Copies were sent out to all the Barons and Bishops in England. Four copies now survive--two of which can be seen in the British Library. It is thought to have been sealed somewhere here on the surrounding meadows. Under the beautiful blue dome with gold stars are the words, "Erected by the American Bar Association." It was built with donations from over 9000 U.S. attorneys. The words inscribed in granite speak for themselves. This is the gateway to the John F. Kennedy memorial, dedicated May 1965 by Queen Elizabeth II and Jacqueline Kennedy. The memorial consists of a garden and a carved tablet of Portland stone with part of JFK's most famous speech. The area of the memorial was given as a gift to the people of the United States by the people of Britain. When one steps through this gate, one is on American soil. 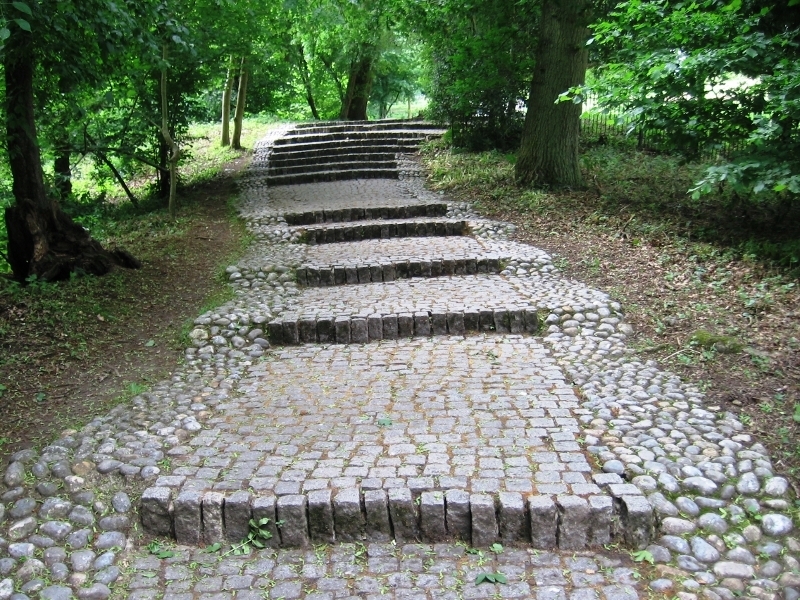 The memorial is reached by walking a steep path of irregular granite steps which represent a journey of pilgrimage. There are fifty steps in all--one for each state in the United States of America. Each step is different from all the others. The entire flight was made from hand hewn blocks of 60,000 granite setts. Jaq says this is one of the most tranquil, touching and inspiring places she's ever visited. It is humble while inspiring great awe. This memorial was carved from a 14 ton block of Roach bedstone weighing 7 tons. Shells trapped within the stone suggest it is at least 7 million years old. This stone rests on a granite cushion representing the shoulders of the multitude. It was designed by Sir Jeffrey A. Jellicoe. Labels: John F. Kennedy, Magna Carta, Runnymede, Thames path, U.S. Post boxes. Hi everyone. I have received so many good wishes that I feel a need to update you all. I have no great pain and expect an appointment very soon. A slow cruise towards Watford with stops along the way is very relaxing. So let`s try and bring the blog a bit more up to date. Thank you. Now this is a great mooring. Others moored here but there is plenty of room to still be well away from the next boat. Of course the permanent residents no nothing of privacy and will sit by the boat and stare through the windows. Behind the 18th century front lies a timber framed building parts of which date back to the 16c. You can just imagine a coach and horses passing through the arch dropping off perhaps Lord Nelson and other passengers to rest for the night. nice to come across so many of these coaching inns as we travel the waterways. Now I can`t pass by any wood and a nice quiet mooring away from anyone is ideal to cut and split it. On the right is a Wey barge, horse drawn and once a very common sight not just on the R. Wey but also the Thames. 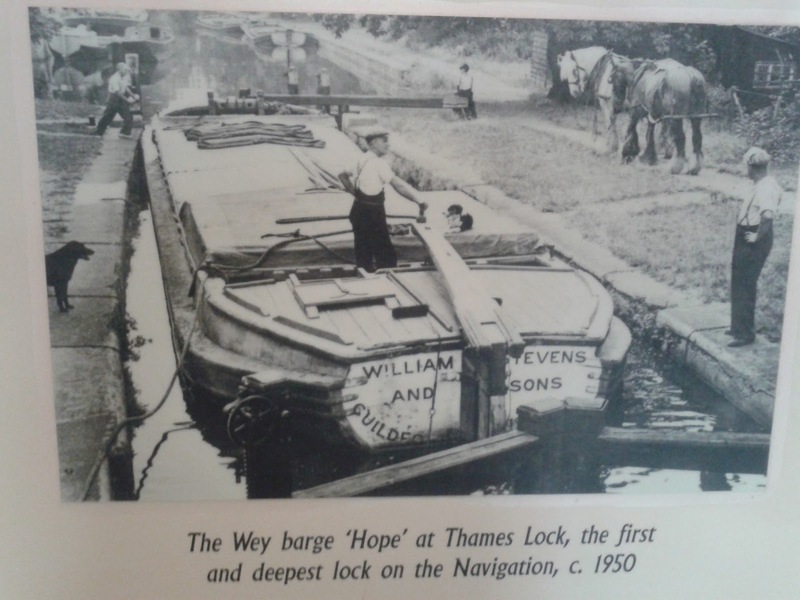 The National Trust is restoring the 1931 Wey barge reliance (below) at Dapdune Wharf. Housing both modern and traditional can be found along the river but mostly it`s rural all the way. I spare you a picture but the elsan (toilet) disposal inside the hut is very basic, pleased we have our composting toilet. As the sign says you wash out your cassette with canal water. A lot of narrow road bridges, some having traffic lights or like this one just common sense. next to the lock. The tap can just be seen to the left of the piling spouting the greenery. Well all good things come to an end. Having paid the National Trust £108 for a 3 week licence we leave where we started at Thames lock. A really good experience on a river flowing through some very nice countryside. After coming off the Tidal Thames at Brentford we stopped to top off our water tank and Les dashed down the street to Morrison's for a few bits and bobs. Off we went, up two locks to moor near the bottom of the Hanwell flight. 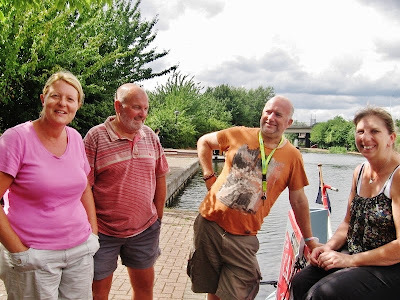 We traveled up the two locks with Malcom and Sue on NB Yorky and Dave and Jane on NB Norfolk Lass, getting to know them as we helped each other up the locks out of Brentford. When we came down this same canal in May on the way down to the Thames, we found it empty and peaceful, with plenty of mooring space. We were also amazed at how clean the Southern Grand Union was--Canal and River Trust (CaRT) had just been down in front of us with barges and nets, tidying up. As we rounded the bend to the same mooring spaces last week, we were surprised to find it rammed with a mix of continuous moorers and summer boaters on their way down to Brentford/The Thames. The recent weeks of scalding hot weather caused bubbles of methane from rotting vegetation to break the surface of the canal. Boats on the move--including ours--churned up the mucky, black bottom, and a terrible stink, or pong as they say over here, filled the air. Just by our bow as we pulled in to moor was a disgusting assortment of piles of dog poop. Yep, we are not on the Thames anymore where one seldom saw such filth and dog owners usually kept their pets on a leash. Sadly we were sure it was a boater whose dog was leaving this mess--let out of a boat in the early morning on its own to do its business. Later events confirmed this to be the case. Our fellow travelers moved on the next morning and we stayed a day to rest, sort out our drawers and wardrobe, and pack up all our winter clothes. We were woken up at 4:30 the next morning by two dogs fighting viciously on the towpath just outside our boat, and a transvestite running down the towpath in a dress and stiletto heels yelling, "Get off of my dog!" We decided to move on later that morning. We shared the locks up the Hanwell Flight with Jim and Joyce aboard NB Joie de Vivre. Jim fished for leftover coconuts from the Festival of Diwali, a celebration in which the local Asian population fill coconuts with scented oil, light them and set them to float in the canal. Jim lines his treasures up on the roof of their boat and enjoys the scent of the oils. We had a good natter about all kinds of things and it was a pleasure to share a bit of canal travel with Jim and Joyce. Ali and John, and Paul and Elaine; fellow boaters and bloggers. and Ali and John aboard NB Triskaideka--fellow bloggers all! We spent a lovely hour and and a quarter having a good chinwag before Ali and John headed north up the G.U., Paul and Elaine headed south for Brentford and the Thames, and we went to the canal side Tescos across the parking lot from where we had all gathered, for a grocery top up. In the golden afternoon sunshine we carried on up through Uxbridge where we stopped for the night. The next morning we started off again sharing a couple of locks with a lovely couple who are just beginning their life afloat--four weeks on the cut!! Eventually we found a shady spot in a lovely slice of canal and we stopped for the day. Sue and Vic on NB No Problem are moored nearby and we've swapped morning tea on each others boats, walks with the dogs and time catching up with one another. As we slowly make our way to Watford it is perfect timing, catching up with Vic and Sue, who are dear to Les' heart and mine. We had a scrumptious dinner invitation aboard Sue and Vic's boat and I will tell you I felt like I had truly arrived! I've been reading about the famous Sunday Suppers aboard No Problem for four years. At last I was going to attend one! The whipped cream and cherry on the top of this was finally properly meeting Graham and Jill aboard NB Matilda Rose whom we had passed along the cut when I first married Les. Graham, Sue, Vic, Jill, and Jaq. Les is taking the snap. We experienced the authentic British Sunday Roast ala Vic--and it was to die for! The roasted potatoes were exquisite, the gravy was mouth watering, the meat tender and juicy, and the Yorkshire puddings were round, crisp clouds filled with gravy. Graham made an Apple Crumble that was perfect in my humble opinion--the topping was sweet with brown sugar and crunchy with oats; the apples were tender but firm--not mushy. Heavenly!! Between the fabulous food, the good wine and the brilliant craic, we were surrounded by love, friendship, and goodwill. This morning Vic and Sue were kind enough to provide me with cooking lessons and recipes for how to make a real British Roast Dinner. I am humbled, happy, and filled with gratitude. Vive la Friendship!! 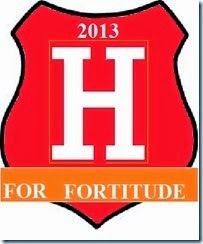 A big thank you for your good wishes that have arrived by blog, e mail and in person. The medication has calmed things down until either CNN or the BBC, film rights still to be finalised, can take their cameras in and seek out the problem. In the meantime we are near family, our own doctor and local hospital. As Jaq has said we have a bit of catching up on the blog but I have some posts prepared ready to slot in as the trip reports move along the Thames. Once again thank you all so much. Our summer cruising plans went like this: early spring, the Lee and Stort (done and done! ), then onto the Thames at Brentford, up river all the way to Lechlade--with a side trip on the River Wey. 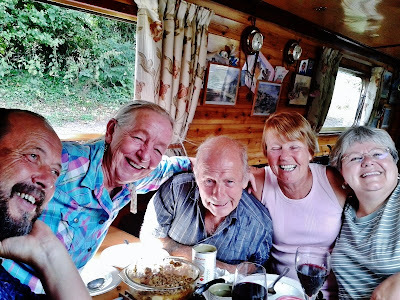 After a summer boating up the Thames and discovering new territory we thought we would turn around at Lechlade, head down river to Oxford and travel up the South Oxford and onward to Napton to visit our friends Andy and Tina, chill out, and think about winter cruising plans. We made it as far as Caversham and had to turn back. Les has not been feeling well for awhile. After a particularly tough night I insisted he see a doctor at the Reading A & E (Accident and Emergency for Americans reading this). Upon an exam, x-rays, and blood tests we were told Les needed to have a colonoscopy and it must be ordered by his GP, so we headed back downstream for Brentford on June 23rd. We are now off the Thames and making our way up the Grand Union toward Watford while waiting for the hospital appointment. We will continue to blog about our Thames experiences until we get caught up to the present moment. Sorry it takes us so long...there just aren't enough hours in the day just now. 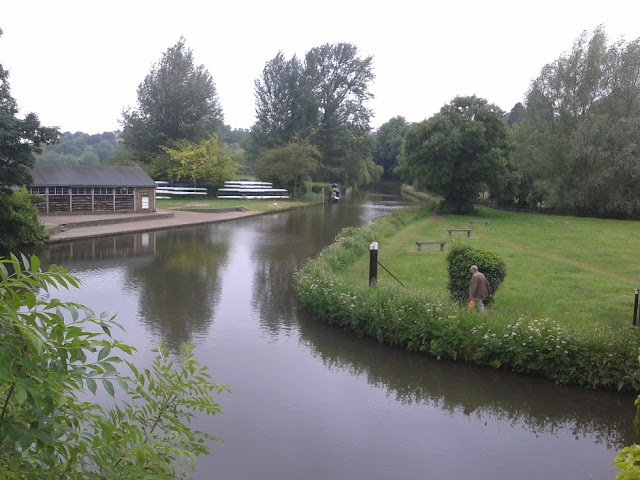 Eventually the urge to move on comes and after a pleasant few days we pushed on to Godalming. This old tree stump looks like a horse`s head. The entry and end (left) of navigation in Godalming is very much a non event. No large basin to wind (turn) just the one warehouse now used by the horseboat as a resting stable. The river makes a sharp turn (right) and becomes shallow so the boats have to turn at this corner amongst boats moored where they can find room. Godalming is a small Surrey town with a good selection of shops. We stocked up on groceries at Sainsbury`s and I managed to get ATF for a gearbox service and distilled water to top up the batteries. Just after leaving Godalming the horse drawn boat carrying a full load of passengers approached. This is Broadford bridge and I can tell you it is a tiny bit higher on the towpath side. On the way back we managed to scrape a lot of rust from the underside of the bridge so I`m guessing about an inch less room this side. The headroom gauge reads 2 meters (6ft 3inches) which could lessen following a lot of rain so be aware if you boat this way. Another lovely mooring just far enough past the bridge that we can`t hear the traffic. Guildford must be the largest town centre on the River Wey but as you can see below we found a lovely mooring next to the water meadows. From here it is just a 10 minute walk into the centre of town. On the walk into town we spotted what could have been a number of things in the past. Too small for railway tunnels--and with the river just behind me--my guess is the river once was more important than the road passing by and this was storage of some kind. The sign between the arches above the seat drew me across the road seeking an answer. It`s a Time Vault sealed by Dame Vera Lynn in 2000 to be opened in 3000. Items sealed in the vault include a Mini car and the flying lady also called the Spirit of Ecstasy--from the hood of a Rolls Royce car. 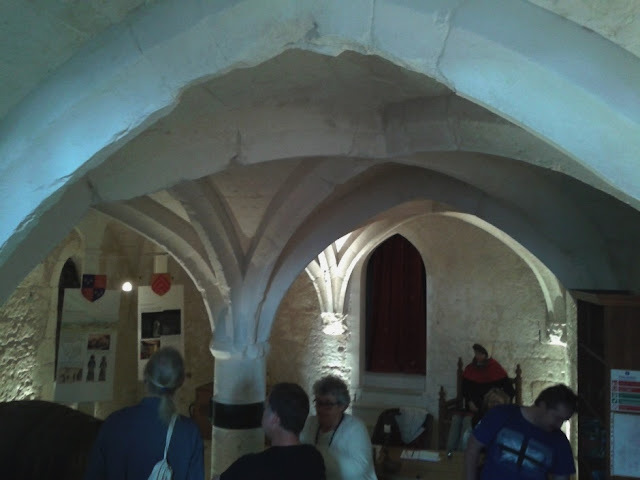 Wouldn`t you just like to be there and see what people make of the contents that reflect on life one thousand years in the past. While there is plenty to see in Guildford, this building caught my eye, standing proud at the top of the high street amongst the shops. More intriguing was the notice (above) posted on the gate. George Abbot was born in a cottage at the bottom of the high street in 1562. 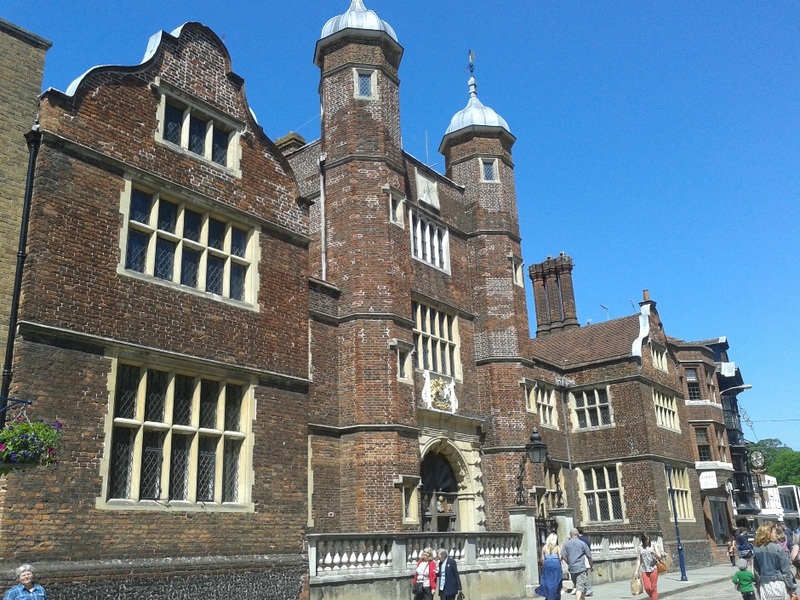 In 1611 he became Archbishop of Canterbury which at that time made him very rich and he decided to build Abbots hospital Alms houses for the poor. On site there are 20 flats, although they state vacant apartment, housing 28 residents. 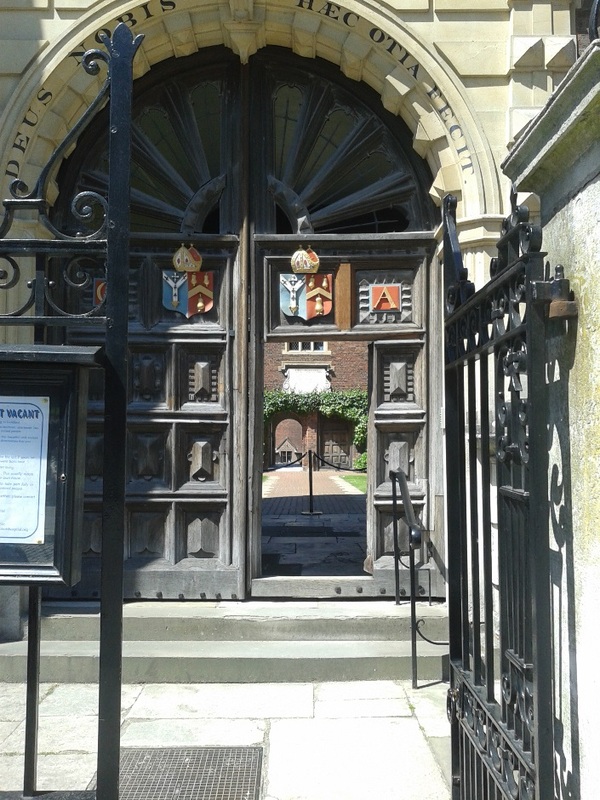 George Abbot is buried in Holy Trinity Church across from the Alms houses. Handy for him to keep eye on his legacy. You really must appreciate the work that went into this and so many of our old buildings. It survives after almost 400 years. I think of today's buildings and wonder how many will survive 400 yrs hence. Stone window openings and those tall chimneys would today be too labour intensive and cost prohibitive. 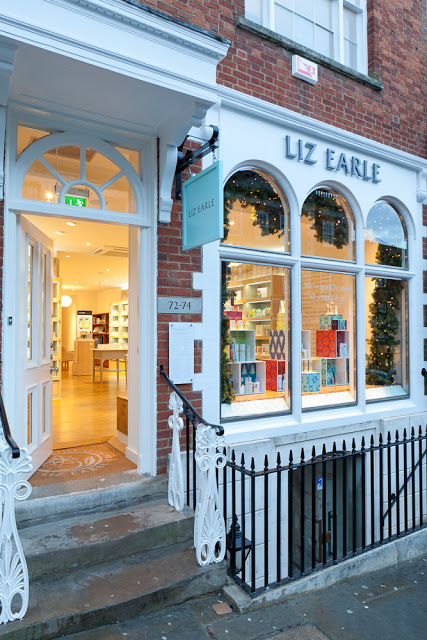 This high street shop looks normal enough but it`s what lies below street level that`s interesting! 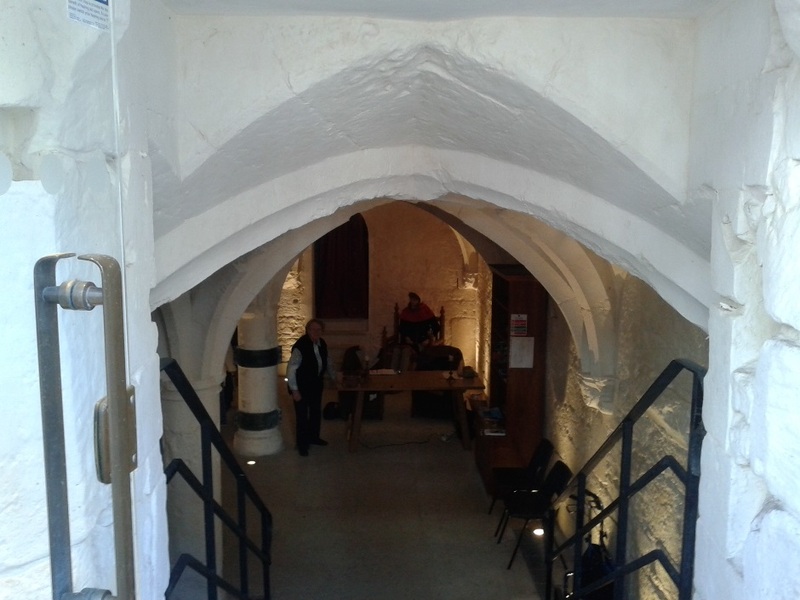 As you go down the steps behind the Black railings you enter a medieval undercroft dating back to the latter part of the 13th century. There are about half a dozen in Guildford but this is the finest in the country. This is a model showing a side view. The steps come down from the street and above the undercroft would have been the merchant's house. This was a very practical use of the buildings footprint and having seen so many stunning basements in the U.S. I cannot understand why we don`t make use of the ground below our homes here in the UK. Guildford is a nice place to spend a few days with the castle and museum being just two more of many attractions in the town. After a few days stay to soak in the delights of Newark and salve our weary selves from the recent ordeal of the Lee and Stort followed on by ten days waiting at Kensal Green for the rain to end and the endurance of a frigid cold, rainy spring season which seemed it would never let up, we got underway again on gorgeous sunny morning, heading to Guildford. Himalayan Rhododendrons and billowing bamboo wave on the breath of spring. ...and all the air conditioning units sit outside on the ground! In the States they are mounted on brackets in the windows of each office. A public path with a directional sign. This path goes from Send to Guildford. The Wey is a quiet, peaceful, clean and contemplative trip through nature. This riverside set of townhouse apartments had a unit for sale on the very far end. You could live here for a mere £650,000.00. We noticed on our trip back down the Wey that this unit had sold. A partially sunken old wooden boat hull lies in dappled shade and river water. Entering Worsfold flood gates. These lock gates are left open unless the river floods--then they are closed to stem the flow. Along the meandering river we cruise, past lush pastures edged with a crochet of spring flowers. Another public footpath right of way traveling up between two farm fields. This one lead to the village of Send. We moored near here on our way back down the navigation and walked this path into town. I managed to restrain myself from taking 300 pictures of every twist and turn but I will say it was an interesting walk. At the top of this hill one reaches a narrow pathway between homes which comes out on a side street. Across the street the foot path continues for about a quarter of a mile between the backs of house with tall fences and overgrown council land edged by the largest oak trees I've ever seen! They stood like sentinels, with huge old branches reaching across the pathway making dense green shade and providing an awning of leaves which kept the rain from our heads. In England the weather literally can and does change continually--it is akin to a kaleidoscope of conditions. One can start out on a walk with a blue cloudless sky and full sun, only to have clouds roll in suddenly form nowhere and rain pelt, pour, or spit down. I've seen it rain while sunny and not a cloud in the sky! I've also seen snow flakes sprinkle the ground--from a blue, cold sky lit with sunshine. There is no accounting for the weather here in Britain--just dress in layers and be prepared to put them on and take them off and put them on and take them off, etc., etc., etc. At one point on our walk into Send the rain poured so hard it soaked the ground in less than two minutes. Les and I stood in an alleyway under a gnarled oak and passed the time smooching. As soon as the vertical water eased off we walked out to the street, turned left and sauntered down the lane to a ball park. We cut across its diagonal field of green grass and tiny white English daisies, to find ourselves on the far end of Send Road. It was a Saturday and we had come into town for a Daily Mail newspaper with the TV guide inside, but as it was threatening to pour again, we spotted a small diner and ducked inside to look at the menu. If you are ever in the village of Send or moored on the Wey nearby, we highly recommend you stop in for breakfast at Astalet Cafe. The food was delicious and the portions were generous. The lattes were gorgeous--just the right mix of hot espresso and frothed milk. The prices were easy on the wallet too. We ate our breakfast in leisure while waiting for the rain to pass. We walked back to the boat through a world washed clean, rain drops dripping from the edges of leaves and glinting like miniature glass balls from blades of grass. This is the footbridge before Trigg's Lock. The river Wey passes underneath, joining up with the Wey navigation. Ahead to the right is the tiny village of Send Grove with its old church. The locals come to the waterhole for a lunchtime drink. The view from behind is every bit as gorgeous as the view in front. I fell like I am traveling inside one of those chalk pictures painted by Burt the chimney sweep in J. L. Travers' book Mary Poppins! I spy, I spy with my little eye--an unusual geometric form in the distance: a large round circle in the top of a tree on the far left. That is mistletoe--a parasitic plant which relies on birds who eat the white berries, and poo them out while sitting on a tree branch. The seed sprouts, put out roots to attach to the tree, and takes nourishment from its host. Looking back across the open meadow, is the village church of Send Grove. A lovely public footpath across the fields of Sendcourt Farm will lead you to its door. On the other side of the Wey Navigation is Sutton Place--and the railings mark the road into the estate. Sutton Place has a fascinating history. It was mentioned in the Domesday Book of 1068 as Sudtone, with assets of three hides (a hide was enough land to support one family although one has no real idea how much land that might be exactly), one mill worth 5 shillings, three ploughs, twenty acres of meadow, and woodland worth twenty five hogs. It rendered an income of £5. The current manor house was built in 1525 by Richard Weston, a brewer for Henry VIII who granted Weston the land after his help negotiating with the French, at the Field of the Cloth of Gold campaign. (One wonders how a brewer assisted in these political negotiations. Perhaps he provided the liquid sustenance to get the whole assembly good and drunk!) With both interior and exterior elements of Italianate art history, the mansion is prized by art lovers and the seclusion of the estate with its large grounds has lead to some interesting owners over the centuries. The first Richard Weston died in 1541. In Sutton Place he built the first great house in England without any defensive fortifications. It is said that the mansion houses the bloodstained ruff of Sir Thomas More (the Archbishop of Canterbury who was beheaded for opposing King Henry's divorce from Catharine of Aragon) and a crystal pomegranate--the device of Queen Catharine--a treasure which once belonged to her. 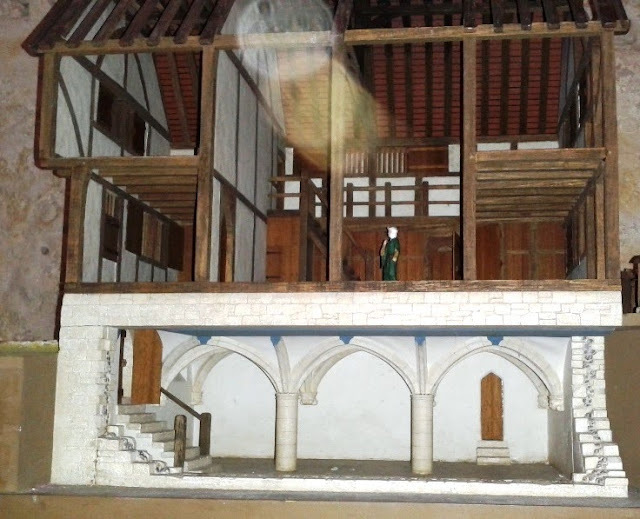 Anne Boleyn was a frequent guest at Sutton Place--it is suggested that Henry first met Anne there--but this association brought tragedy to Sutton Place and the Weston family. Sir Richard's son Frances was much favored by Henry VIII and brought to court at the tender age of fifteen. He married at age nineteen and by twenty one his future was looking bright as he was made a Gentleman of the Privy Chamber. During his tenure waiting upon Henry and Anne he grew to know the second of Henry's queens quite well. Sadly Frances was considered by Henry to be expendable. The king used Frances' friendship with the queen as an instrument in her removal. Sir Frances Weston was accused of adultery and beheaded two days before Anne Boleyn. It is said their ghosts roam the halls of Sutton Place. Richard Junior inherited the estate and introduced innovative agricultural practices on the property which were to give birth to the canalized river Wey. The Weston family maintained title to the estate until 1919. In 1959 the world's richest private citizen at the time--J. Paul Getty--purchased Sutton Place and spent the final seventeen years of his life in glorious seclusion there. Upon his death in 1976 it was sold for £8 million, and purchased by privately wealthy American Stanley J. Seeger--unknown generally except for his endowment of a chair of Hellenic studies at Princeton University. Although it is said Seeger spent one million pounds annually on its upkeep, he seldom ever lived at Sutton Place. After a decade Seeger sold the mansion and land to wealthy American Frederick R. Koch who set up the Sutton Place Foundation and used the premises to display his vast art collection. Having never spent a single night under its roof, Koch sold Sutton Place for £32 million in 1999. In January 2003 it was offered for sale for £25 million--the estate then encompassed 18 properties including an 18 bedroom farmhouse. Since 2011 the property has been owned by Russian millionaire businessman Alisher Usmanov. Some of the properties along with some estate land have now been sold. Apparently there are public right of way footpaths across the estate--so we may well look for those when next we visit the Wey. The Wey Navigation bends in a dogleg and travels through the estate of Sutton Place. Broad Oak Bridge allows the current Lord of the Manor to access a farm on the estate land. A beautiful blue dragonfly on the wing! I am so chuffed to have caught it on my camera. Les standing above Bower's Lock looking out at the VERY sharp 90 degree left turn into the lock. The river Wey flows right past just beyond the open lock gates. This is Bowers Mill house at the top of the lock. The tight bend just below the lock pushes the River Wey Navigation back on to the River Wey proper at this point. 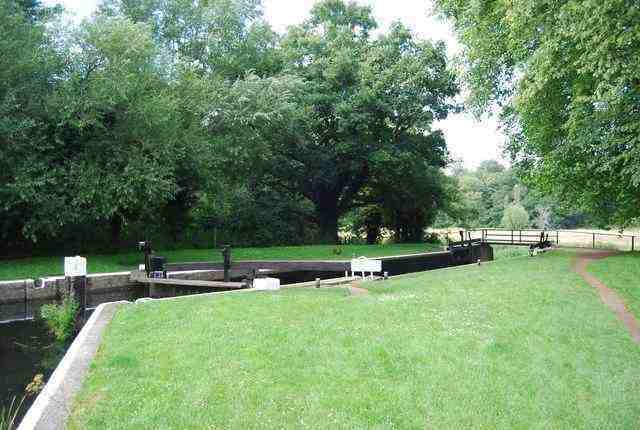 Opened in 1653, this lock is nestled amongst mature oaks with Bowers Mill house nearby. The original mill is long gone but was built originally by the Duke of Sutherland (one of Weston's relatives) as a laundry for nearby Sutton Place. Later the mill made paper, flour and linseed before closing for good in 1910 and being demolished in 1947. Horses grazing in a field of yellow buttercups. Wey Navigation depth gauge--for flood purposes. 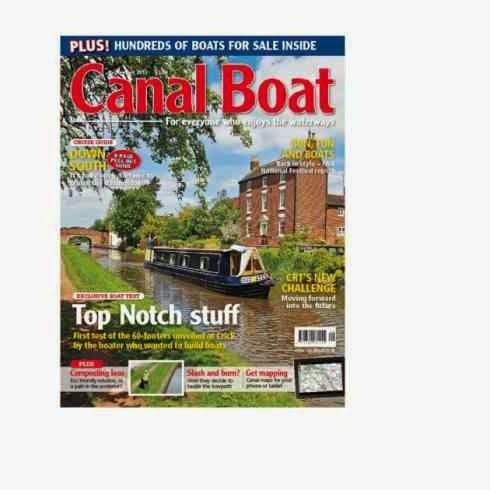 It looks like this narrow boat is sitting in a field doesn't it? Actually it is behind us and we are on a bend looking across a field to the river on the other side of the bend. 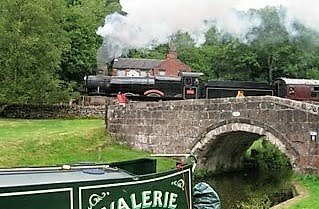 We felt like we had somehow escaped 2013 and were floating down a timeless river with dappled shade, sun playing peekaboo through the leaves of trees, the quiet of the countryside coddling us along. As we progressed toward Guildford we came into a suburb and...look at the size of this Gunnera! That was in early June--no telling how big it is now with the two weeks of total sun and hot weather we've had. This picture is a great example of the typical long, narrow "back gardens" as Brits call their back yards. Shall we put up the umbrella and mix up a pitcher of Pimms? A couple of blokes paddle boarding down the river! 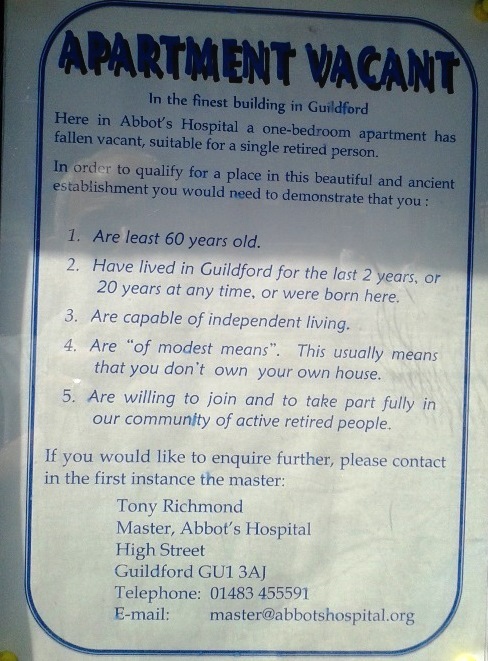 I've left the pictures of Guildford itself for Les' post. We came up through the town and its lock, and decided to moor here--Guildford water meadows. The breeze ruffled the dangling willow branches and the afternoon sun made us drowsy. This is a perfect place to moor up for a few days. 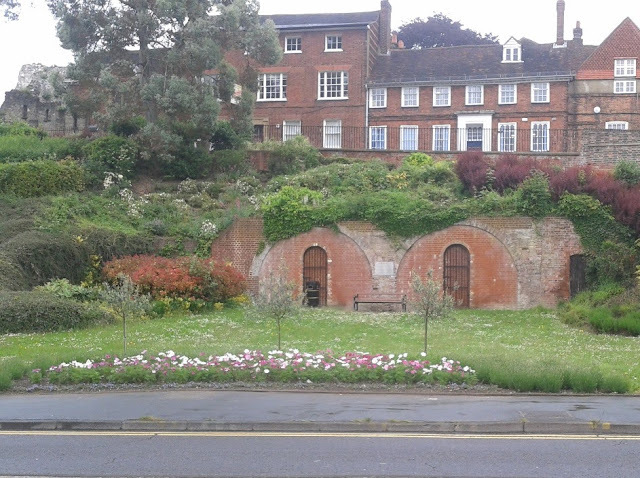 A five minute walk into Guildford will allow us to sample its delights! Once moored up, this was the view across the Shalford Water meadows. The water meadows were Richard Weston Junior's idea of moving the water. Ditches were dug across the meadows to the river Wey. Gates called Penstocks were installed to allow water from the river to flood the flat wide meadows consisting of 140 acres. This protected the town from flooding. Now days the meadows are kept clear of trees except for willows at the river's edge. This allows a meadow habitat to flourish and Guildford county council leases the land for the grazing of rare breed Gloucester cattle. In past centuries when the weather was colder in winter, the meadow was flooded and used as a public skating rink!